How does the Tacoma compare in reliability to the Chevy Colorado and Nissan Frontier? Since Toyota redesigned the Tacoma for 2016 and the Colorado was all new for the 2015 model, this is a difficult question to answer. However, historically the Tacoma has been very reliable and the Colorado less so. The current Frontier is an old design and seems to be just slightly behind the Tacoma in most areas as far as repair rates go. If you look at the so-called reliability data collected by that "leading consumer magazine", you'll see what I mean. As the stock brokers and finanical advisors say: "past performance is no guarantee of future results". 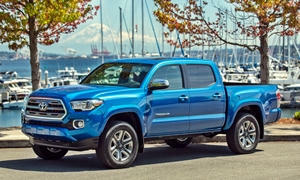 As an owner of a 2013 Tacoma (std cab, 4 cyl), my take is that it would be hard to go wrong with the Tacoma if its size and features match your needs since so much of the new design is really a carryover from the previous generation. The new GM's are greatly improved. A person at work has one and it is one nice looking truck. I would always get the V6. The GM's get better mileage than the Toyo's . I will be looking at the GM's the next time im in th emarket. I'm hoping they make a new SUV out of the platform to replace the Trailblazers . I have looked both the Tacoma and the GM twins at length. I am still on the fence about them. The Toyota should be the more reliable one. The Tacoma also has the highest resale value of almost any vehicle. That being said my main issue with the Tacoma is they place the front seats close to the floor and have no power or manual adjustment of the bottom seat cushon. Being 6' 2" this puts me at a ackward driving angle. They also have worse fuel economy then the GM Twins. The GM twins you can also get a Duramax Diesel which gets excellent fuel economy. For this reason I am leaning more towards the GM twins. It really comes down to how long are you going to keep it? 60k miles or more - Get the Toyota. The Tacoma higher resale is a flick of sorts. That is based on MSRP which no one pays, I hope. The Colorado discounted is $8,000-10,000 less expensive than the Tacoma today. If you compare 2006-2007 prices the Colorado is....you guessed it, $9,000-10,000 less expensive. The residuals are a leaning in favor of the Colorado. Besides today's Colorado has won most of the comparison tests against the Tacoma.